Bangladesh is one of the world's most densely populated countries which became independent in 1971 after a 9 months long liberation war with Pakistan. “People’s Republic of Bangladesh” is the official name of Bangladesh. Bangladesh has total area of 144,000 sq km (55,598 sq miles.) 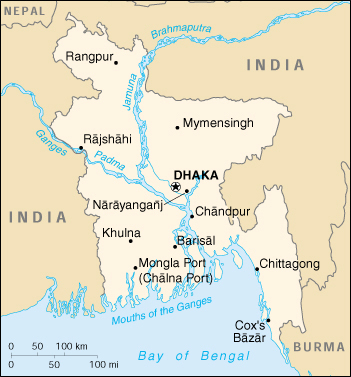 Bangladesh has border with India on all sides except for a small border with Burma (Myanmar) to the far southeast and by the Bay of Bengal to the south. Bangladesh has so many rivers running across the country and thus it is called a country of river too. Serious Poverty is noticed across the country and more than half of the population live “hand to mouth” with an income of less than one dollar a day. Some improvement is seen in the main cities but abject poverty still dominating the villagers for sure. Bangladesh has made improvement on education and health sector with significant success in controling population outburst. But with high number of unemployment, unstable political situation, corruption and agriculture being the main employer, the country is struggling to make a sustainable development. Bangladesh is trying to develop its economy by attracting overseas investors, with industrial development a priority. Overseas investors have made significant investment in Bangladesh especially in garments sectors. Many people are also seeking to work abroad and therefore foreign remittance is making a contribution to the country’s economy. Bangladesh has a significant gas reserve which has been confirmed by experts and many international energy companies are working in the gas sector. The country is suffering from energy shortage and a debate is already taking place whether this gas should be kept reserved for meeting domesticl demand or should be exported. Political instability is surely holding the country’s development. Antagonism between political parties is so fierce which lead killing of opponent party members over time. Bangladesh also suffered 15 years of military rule and democracy was restored in 1990 after a long bloodshed and political instability. Natural disasters also ruthlessly affected many time killing thousands of people and destroying houses, cattle and crop fields. It is a low lying country regularly affected by flooding and cyclones. The main two televsion and radio broadcaster are owned by the government and has little or no coverage for opponent Political Parties. There are many other privet Television and Radio channels offer service to Bangladeshi people. Popular satellite and cable channels include ATN, Channel i, NTV, RTV, Channel One, BanglaVision and Boishakhi.